Defending champion Sloane Stephens and six-time winner Serena Williams, both of whom have strong Northern California ties, won't have to worry about facing Simona Halep before the U.S. Open final. Halep today became the first top-seeded woman to lose her opening match in the tournament's 50-year history. In the first match in rebuilt Louis Armstrong Stadium, she was overpowered by 44th-ranked Kaia Kanepi of Estonia 6-2, 6-4 in 76 minutes. The 5-foot-11 (1.81-meter) Kanepi, a quarterfinalist last year in Flushing Meadows, is five inches (12.7 centimeters) taller than Halep. Halep also lost in the first round of last year's U.S. Open, to 2006 champion Maria Sharapova, after reaching the quarterfinals in 2016 and semifinals in 2015. "I never play my best tennis here, even if I've done quarterfinals, semifinals," Halep moaned to reporters. "I feel like my game is not at its best, but always I fight for every match. "Maybe it's the noise in the crowd; the city is busy. It's everything together. I'm a quiet person, so maybe I like the smaller places." Like Paris? Halep won her first Grand Slam title in the French Open in June and tuned up for the U.S. Open by winning Montreal and holding championship point before losing to Kiki Bertens the following week in Cincinnati. 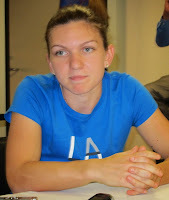 "I was tired (today), but positive tired because I played so many matches in Montreal and Cincinnati," said Halep, who withdrew from last week's Connecticut Open with an Achilles injury. " ... Today was not my day; the balance was not there. I couldn't feel myself strong on the court to win this match. I was actually practicing OK yesterday and two days ago, but that's it. It's just a day, and it's a bad day for me. She deserved to win because she was playing better than me today." Five other times, a woman has lost in the first round of a Grand Slam tournament since professionals were admitted in 1968. Also owning that dubious distinction are Martina Hingis (twice) and Steffi Graf at Wimbledon, Angelique Kerber at the French Open and Virginia Ruzici at the Australian Open. Ruzici, like Halep, is Romanian. Halep could have faced Williams, seeded 17th, in the fourth round and Stephens, seeded third, in the semifinals. Williams, who has a residence in Silicon Valley, defeated Magda Linette of Poland 6-4, 6-0 in 69 minutes in a featured night match. Stephens, a Fresno product, beat Evgeniya Rodina of Russia 6-1, 7-5. Rodina, a mother like Williams, reached the fourth round at Wimbledon as a qualifier last month. On Wednesday, Williams is scheduled to play No. 101 Carina Witthoeft of Germany, and Stephens is set to meet No. 134 Anhelina Kalinina, a qualifier from Ukraine. Kalinina won the 2015 Sacramento Challenger at age 18. Meanwhile, all three men with NorCal connections who played today lost. Andreas Seppi, a 34-year-old Italian, topped 6-foot-6 (1.98-meter) Sam Querrey, a 30-year-old San Francisco native, 6-7 (6), 6-4, 6-2, 2-1, retired on a hot, humid day. David Ferrer of Spain and qualifiers Felix Auger-Aliassime of Canada and Kathinka Von Deichmann of Liechtenstein also quit in their matches. No. 11 seed John Isner, 6-foot-10 (2.08 meters), pounded 20 aces in a 7-6 (3), 6-3, 6-4 victory over fellow American Bradley Klahn, a 28-year-old Stanford graduate. Isner, 33, is having the best year of his career, winning his first Masters 1000 title in Miami and reaching his first major semifinal at Wimbledon. Red-hot Ugo Humbert of France outclassed fellow qualifier Collin Altamirano, 22, of Sacramento 6-3, 7-6 (4), 6-3. Humbert, 20, has reached the final of his last three tournaments, all hardcourt Challengers. He lost to Klahn in Gatineau, Canada, and to Canadian Peter Polansky in Granby, Canada, but defeated Spaniard Adrian Menendez-Maceiras in Segovia, Spain. ESPN3 and ESPN+ will provide coverage of all courts daily from 8 a.m. to 8 p.m. Live streaming is available on WatchESPN. First round, 9 a.m.-3 p.m., ESPN. First round, 3-4 p.m., ESPN2. First round, 4-8 p.m., ESPN2. First round, 9 a.m.-4 p.m., ESPN. First round, 4-8 p.m., ESPN. Second round, 9 a.m.-4 p.m., ESPN. Second round, 4-8 p.m., ESPN. Second round, 9 a.m.-3 p.m., ESPN. Second round, 3-4 p.m., ESPN2. Second round, 4-8 p.m., ESPN2. Third round, 9 a.m.-3 p.m., ESPN2. Third round, 3-4 p.m., ESPN2. Third round, 4-8 p.m., ESPN2. Third round, 8 a.m.-4 p.m., ESPN2. Round of 16, 8 a.m.-4 p.m., ESPN. Round of 16, 4-8 p.m., ESPN2. Round of 16, 8 a.m.-4 p.m., ESPN2. Quarterfinals, 9 a.m.-3 p.m., ESPN. Doubles/juniors/wheelchair, 9 a.m.-4 p.m., ESPN3 & ESPN+. Women's singles semifinals, 4-8 p.m., ESPN. Juniors/wheelchair, 9 a.m.-4 p.m., ESPN3 & ESPN+. Men's doubles final, 9-11 a.m., ESPN2. Men's singles semifinals, 1-8 p.m., ESPN. Mixed doubles final, 9-11 a.m., ESPN3. Women's singles final, 1-4 p.m., ESPN. Juniors/wheelchair, 9 a.m.-2 p.m., ESPN3 & ESPN+. Men's singles final, 1-4 p.m., ESPN. Collin Altamirano recorded the biggest win, literally and figuratively, of his blossoming career today. The 22-year-old wild card from Sacramento knocked off 6-foot-11 (2.11-meter) Ivo Karlovic, seeded 22nd, 7-5, 6-4 to reach the final round of U.S. Open qualifying in Flushing Meadows, N.Y.
Karlovic, 39, of Croatia is ranked No. 137 after reaching a career-high No. 14 in 2008. The highest-ranked player Altamirano, who's in his first full year as a professional, had beaten was No. 160 Darian King of Barbados. Karlovic, the all-time leader in aces by more than 2,000, had 15 against Altamirano with four double faults. Both players won more than 80 percent of the points on their first serve, but the 6-foot-2 (1.88-meter) Altamirano won 65 percent of the points on his second delivery (17 of 26) to Karlovic's 42 percent (11 of 26). Altamirano converted two of six break points and saved all four against him. Altamirano, ranked a career-high No. 345 after beginning the year at No. 761, will face 10th-seeded Lorenzo Sonego, a 23-year-old Italian, for the first time on Friday not before 11 a.m. California time (Tennis Channel). Sonego, ranked No. 117, outlasted Guilherme Clezar of Brazil 7-5, 5-7, 6-3 in two hours, 58 minutes. Altamirano seeks his second berth in the main draw of the U.S. Open. He won the USTA boys 18 national title in 2013 to earn a wild card into the Open and lost to No. 22 seed Philipp Kohlschreiber of Germany 6-1, 6-3, 6-1 in the first round. Altamirano's fellow pupil at the JMG Tennis Academy in Sacramento, Jenson Brooksby, repeated Altamirano's USTA feat this year and drew John Millman of Australia in the first round of the U.S. Open. This year, Altamirano has won his first two Futures singles titles ($25,000 Long Beach in January and $15,000 Singapore in May) and reached his first Challenger semifinal ($75,000 Winnetka, Ill., last month). In his last three tournaments, he has advanced to the quarterfinals of the $75,000 Lexington (Ky.) Challenger, the semifinals of the $25,000 Iowa City Futures and the Winnetka semis. Sonego reached the second round of the Australian Open and lost in the first round at Wimbledon this year, qualifying in both tournaments. Last fall, he played in five consecutive Challenger or Futures finals, winning two (one on clay and one on hard court). Advancing to the final round of women's qualifying today was 10th-seeded Nicole Gibbs, a 25-year-old ex-Stanford star who beat Tamara Korpatsch of Germany 6-4, 7-6 (6). Gibbs, ranked No. 115, will meet Belarus' Olga Govortsova, a former top-35 player rebounding from injuries, for the first time on Friday at 8 a.m. Govortsova, playing on her 30th birthday, topped 21st-seeded Fiona Ferro of France 4-6, 6-4, 6-4 after eliminating 2013 Wimbledon runner-up Sabine Lisicki 6-4, 7-5 in the first round. 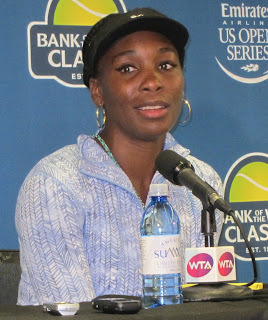 Gibbs has reached the second round of the main draw in the U.S. Open for the past three years, and she advanced to the third round at Flushing Meadows in 2014. Gibbs' former Stanford teammate, Kristie Ahn, lost to ninth-seeded Ons Jabeur of Tunisia 6-1, 6-2 in 45 minutes. Ahn, who's based in Boca Raton, Fla., grew up near New York in Upper Saddle River, N.J. Jabeur won the French Open girls singles title in 2011. The good news for Collin Altamirano is that he won his first-round match in U.S. Open qualifying in 48 minutes today. The bad news for the 22-year-old wild card from Sacramento is that he will face 6-foot-11 (2.11-meter) Ivo Karlovic, the all-time leader in aces, on Thursday. Tennis Channel's coverage of the second round will begin at 8 a.m. California time, and Altamirano and Karlovic will meet for the first time at about 2 p.m.
Altamirano crushed Tomislav Brkic of Bosnia and Herzegovina 6-2, 6-0 in Flushing Meadows, N.Y. The 22nd-seeded Karlovic, from Croatia, beat Illya Marchenko, a former top-50 player from Ukraine rebounding from shoulder surgery, 6-3, 7-6 (7). Karlovic, 39, has blasted 12,936 aces in his career, over 2,000 more than anyone else. Roger Federer, 37, ranks second with 10,645, and 6-foot-10 (2.08-meter) John Isner, 33, is third with 10,617. Karlovic is ranked No. 137 after reaching a career-high No. 14 in 2008. He reached the fourth round of the U.S. Open two years ago for his best result at Flushing Meadows. Karlovic has won eight career ATP titles in singles and two in doubles. Altamirano has soared from No. 761 at the beginning of 2018 to a career-high No. 345 in his first full year as a professional. In his last three tournaments, the former University of Virginia standout has reached the quarterfinals of the $75,000 Lexington (Ky.) Challenger, the semifinals of the $25,000 Iowa City Futures and the semifinals of the $75,000 Winnetka (Ill.) Challenger. Earlier this year, Altamirano won his first two Futures singles titles. Defending champion Sloane Stephens, a 25-year-old Fresno product, is seeded third in the U.S. Open behind Simona Halep and Caroline Wozniacki. All three have won one Grand Slam title, with each coming in the past year. 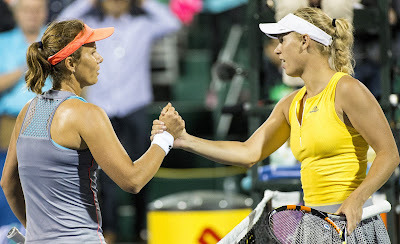 Wozniacki and Halep broke through this year in the Australian Open and French Open, respectively. Halep defeated Stephens in the final at Roland Garros. The U.S. Open seedings were announced today. The draw will be held Thursday, and the tournament is scheduled for Monday through Sept. 9. Serena Williams, a 36-year-old San Francisco resident, is seeded 17th. Williams, who missed last year's U.S. Open while having her first child, can tie Margaret Court's record of 24 Grand Slam singles titles. The finalists of this month's inaugural Mubadala Silicon Valley Classic in San Jose, champion Mihaela Buzarnescu of Romania and Maria Sakkari of Greece, are seeded 21st and 32nd, respectively. All Nicole Gibbs needed was a trip back to Flushing Meadows to snap out of her funk. The 10th-seeded Gibbs (Stanford, 2011-13) routed Tereza Mrdeza of Croatia 6-1, 6-1 in 61 minutes today in the first round of U.S. Open qualifying. Gibbs, a 25-year-old resident of Venice in the Los Angeles area, ended a four-match losing streak that began with a 6-0, 6-4 loss to 19-year-old American Sofia Kenin in the final of last month's $60,000 Berkeley Challenger. Kenin was seeded first and Gibbs second. Gibbs has reached the second round of the main draw in the U.S. Open for the past three years, and she advanced to the third round at Flushing Meadows four years ago. The 115th-ranked Gibbs is scheduled to play No. 181 Tamara Korpatsch of Germany for the first time on Thursday. Korpatsch, 23, topped Deniz Khazaniuk of Israel 4-6, 6-4, 6-3. Gibbs' former Stanford teammate, Kristie Ahn, also advanced to the second round of qualifying. Ahn, 26, defeated Katarina Zavatska of Ukraine 6-4, 6-3. Ahn, ranked No. 145, will face Tunisia's Ons Jabeur, seeded ninth with a world ranking of No. 114. Jabeur, the 2011 French Open girls singles champion, dismissed Katy Dunne of Great Britain 6-2, 6-1 in 49 minutes. Jabeur defeated Ahn 6-4, 6-4 on clay in the quarterfinals of an $80,000 tournament in Indian Harbour Beach, Fla., in April 2017 in their only previous meeting. Two other former Stanford players, one woman and one man, fell today. Carol Zhao, 23, lost to fellow Canadian Eugenie Bouchard, seeded 16th, 6-0, 6-1 in 54 minutes. Zhao, ranked No. 161, is 0-6 since reaching the second round of a $125,000 clay-court tournament in Bol, Croatia, in early June. Bouchard, the runner-up to Petra Kvitova at Wimbledon four years ago, has plummeted from a career-high No. 5 in October 2014 to No. 123. 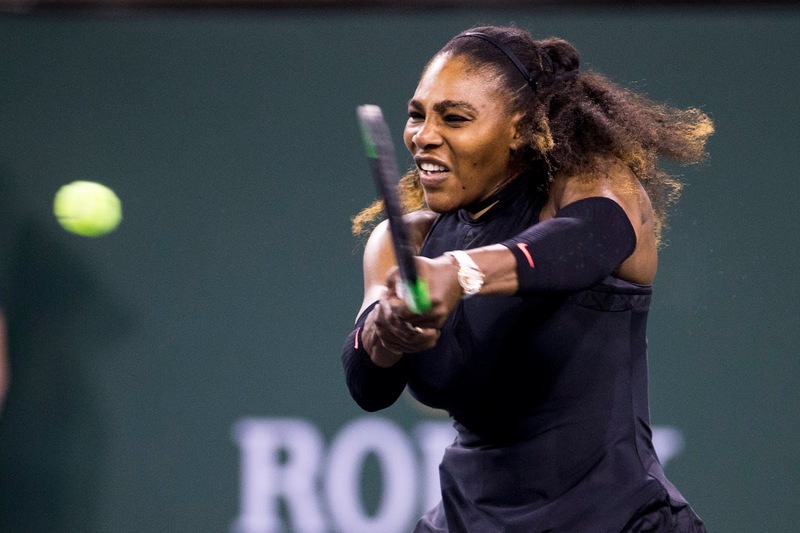 She suffered a head injury in a training room fall during the 2015 U.S. Open, sued the United States Tennis Association and reached a settlement last February. Tom Fawcett, 22, of Winnetka, Ill., lost to Alexey Vatutin of Russia 6-4, 3-6, 6-1. Also in men's qualifying, 18-year-old Sebastian Korda upset 24-year-old San Jose product Dennis Novikov 4-6, 7-5, 6-2 in a matchup of 6-foot-4 (1.93-meter) U.S. wild cards. Novikov, now based in Los Angeles, led by a set and an early service break. Korda won this year's Australian Open boys singles title 20 years after his father, Petr, captured the men's singles title in Melbourne. Novikov, ranked No. 258 after climbing to a career-high No. 119 two years ago, fell to 1-9 since April. He reached the second round of the main draw in the 2012 U.S. Open after receiving a wild card as the USTA boys 18 national champion. Collin Altamirano, a 22-year-old wild card from Sacramento, is scheduled to open against Tomislav Brkic, 28, of Bosnia and Herzegovina on Wednesday. Brkic is ranked No. 256, and Altamirano is at a career-high No. 345. The almost-nonstop injuries finally got to Dmitry Tursunov. The Moscow native, who was based in Northern California from age 12 to 30, has unofficially retired at 35. Fittingly, Tursunov's last match was in Northern California, and he was unable to complete it. As a qualifier in the $100,000 Stockton Challenger last October, he retired from his quarterfinal against U.S. prospect Michael Mmoh with leg problems after losing the first set 6-3. "It was going to take me three months to do rehab, which was going to be a little too long," Tursunov, who owns a townhouse in the Sacramento suburb of Folsom that he rents out, said this week. "There were too many uncertainties. At that stage, it wasn't worth the trouble to try to get back. It's muscular, tendon-related (in the quadriceps above both knees). I don't know the exact diagnosis." Then the irreverent Tursunov, who was perhaps the most colorful player in men's tennis, used one of his trademark analogies. "It's like a bad car alignment that starts affecting a lot of other things," he said. "Your tires wear, your springs and shocks get all weird, and your suspension goes bad. Then you say, it's time to get a new car instead of always trying to fix this one." Tursunov said his retirement "isn't official." But when asked if he's thinking of playing again, Tursunov replied: "Not so much really, no. A lot of people ask me that, but I think those days are over." Tursunov spoke from Cincinnati, where he's coaching 20-year-old Aryna Sabalenka of Belarus. She is scheduled to play top-ranked Simona Halep on Saturday in the semifinals of the Western & Southern Open in Cincinnati. "I'm enjoying helping a player," Tursunov said. "I like her; she's a nice person. She listens. She wants to get better. I feel like she has very good potential. I feel like I'm part of something a little bit bigger than trying to revive a career." Tursunov also coached fellow Russian Elena Vesnina, who reached career highs of No. 1 in doubles in June and No. 13 in singles in March 2017, early this year. Ironically, she has been sidelined with a knee injury since the French Open. Tursunov said nothing has been decided when Vesnina returns and he has no plans other than to continue coaching Sabalenka, who will crack the top 30 for the first time in Monday's updated rankings. The hard-hitting Tursunov, hobbled by injuries throughout his career, peaked at No. 20 in singles in 2006 and No. 36 in doubles in 2008. He won seven ATP titles in singles and seven in doubles, and collected $5.9 million in prize money. Tursunov helped Russia win the Davis Cup in 2006 and played in the 2008 and 2012 Olympics. In the match of his life, he outlasted Andy Roddick 17-15 in the fifth set in four hours, 48 minutes on clay in Moscow to clinch Russia's victory over the United States in the 2006 Davis Cup semifinals. Off the court, Tursunov became the talk of the tour as the ATP's resident blogger in 2006 but gave it up because it took too much time. With his curly, blond hair, blue eyes and impeccable, accent-less English, Tursunov easily could be mistaken for a Southern California surfer. In fact, his countrymen called him "Surfer Dude." Tursunov doesn't consider his career in terms of whether he was happy with it. Characteristically, he has a more philosophical view. "I don't know. I don't know what to compare it to," he said. "If you compare it to someone who didn't get to 20, then I'm happy. If you compare to someone who got to No. 1, I guess I'm unhappy. "I look at it more as a set of experiences. Now that it's sort of, unofficially over, it's a question of, how can I use all of that knowledge and experience? I can't just frame it and post it on the wall. I found a logical use for it by trying to help somebody else correct some of the mistakes a little bit earlier and make her sailing a little bit smoother than mine was." Tursunov, who finished with a career record of 231-218, also was philosophical about what he'll miss most and least about playing. "When you have a good day at the office, it's always fun," he said. "I never really loved competing. There are some people who love competing, and I wasn't one of them. Still, when you win, everything is good. You feel like your life is good, and you get used to your results (defining you). It's a bad day if you lose and a good day if you win. "But there's a lot of work behind the scenes that is not fun, and I'm definitely not missing that part -- working hard and sweating and forcing yourself to do something and setting limits for yourself in order to get better." Unlike many players, Tursunov seems to have made a smooth transition to retirement. "I'm happy," he said. "My life is a little bit more relaxed. It's a different type of responsibility. I'm out of the limelight, and I'm completely fine with it. I'm happy with my secondary role, not being the priority. "Some people can't get over the fact that their career is over, so they search for adrenaline rushes. I'm OK. I'm not trying to do that." Five years ago, Collin Altamirano and Jenson Brooksby from the JMG Tennis Academy in Sacramento won USTA Boys National titles in the 18s and 12s, respectively. Today, Brooksby repeated Altamirano's feat to earn a wild card into the U.S. Open main draw later this month. The fourth-seeded Brooksby, 17, dominated third-seeded Brandon Nakashima of San Diego 6-4, 6-3, 6-1 in Kalamazoo, Mich. Brooksby, who's headed to Texas Christian in the fall of 2019 or in January 2020, did not lose a set in the tournament. The U.S. Open is scheduled for Aug. 27 to Sept. 9 in Flushing Meadows, N.Y.
Altamirano lost to No. 22 seed Philipp Kohlschreiber of Germany 6-1, 6-3, 6-1 in the first round of the 2013 U.S. Open. He turned pro in June 2017 after his junior year at Virginia, which won the NCAA title in all three of his years there. Now 22, Altamirano has soared from No. 761 at the beginning of the year to a career-high No. 347. WTA tour -- In a rematch of the French Open final, top-ranked Simona Halep outlasted third-seeded Sloane Stephens 7-6 (6), 3-6, 6-4 in 2 hours, 41 minutes to win the Rogers Cup in Montreal. Stephens, a 25-year-old Fresno product, led 4-0 in the tiebreaker and had four set points in the first set. Halep defeated Stephens 3-6, 6-4, 6-1 at Roland Garros for her first Grand Slam title after going 0-3 in major finals. Stephens won her only Grand Slam title in last year's U.S. Open, beating countrywoman and close friend Madison Keys. ITF Pro Circuit -- No. 3 seed Madison Brengle defeated unseeded fellow American Kristie Ahn 6-4, 1-0, retired in the final of the Koser Jewelers $60,000 Tennis Challenge in Landisville, Pa.
Ahn, a 26-year-old Stanford graduate, suffered a heat-related illness. USTA NorCal -- No. 1 seeds Karue Sell of Los Angeles and Chanel Simmonds of South Africa defeated the No. 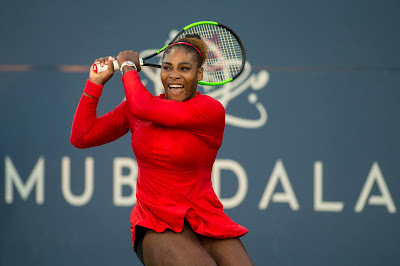 2 seeds to win the men's and women's singles titles, respectively, in the $25,000 Heritage Bank of Commerce Open Tennis Championships at the Moraga Country Club in the San Francisco Bay Area suburb of Moraga. Sell, a former UCLA standout from Brazil, routed Jianhui Li of West Harrison, N.Y., 6-1, 6-1 to repeat as the champion. Simmonds beat Jacqueline Cako of Brier, Wash., 6-0, 6-4. The top seeds also won the titles in men's doubles (Austin Rapp and Sell), women's doubles (Cako and Simmonds) and mixed doubles (Cako and Joel Kielbowicz of Scottsdale, Ariz.). It's only a Challenger title, but Thanasi Kokkinakis will take it. 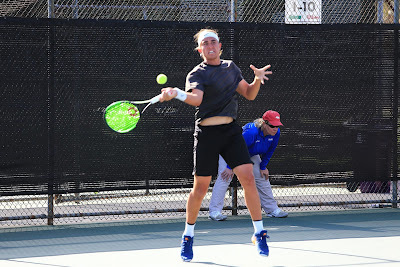 Kokkinakis, who was on his way to stardom three years ago before injuries derailed his career, dominated Lloyd Harris 6-2, 6-3 in 67 minutes today to win the $100,000 Nordic Naturals Challenger at the Seascape Sports Club in Aptos, Calif. It was Kokkinakis' first title since he won the 85,000 euro ($96,781) Bordeaux Challenger on clay as a qualifier in May 2015. The following month, he reached a career-high No. 69 in the world at age 19. Later that year, the right-hander hurt his right shoulder lifting weights -- not to improve his tennis but to look better in Nike's new sleeveless shirts -- and had surgery. Because of that and numerous other injuries, he played only one match in 2016 and seven tournaments last year. Kokkinakis reached his first ATP final last August in Los Cabos but lost to promising American Taylor Fritz 7-6 (6), 7-6 (5) in the first round there last week. That dropped Kokkinakis' ranking 104 places to No. 268. He will rise to No. 201 on Monday. Before losing to Kokkinakis in Saturday's semifinals, top-seeded Thomas Fabbiano of Italy predicted the 22-year-old Australian, who stunned Roger Federer in the second round at Miami in March, eventually will crack the top 10. Kokkinakis, seeded fourth, emphatically ended the unseeded Harris' winning streak at nine matches. Harris, who won his first Challenger title last week in a $75,000 tournament in Lexington, Ky., lost no more than four games in a set during his streak. Kokkinakis dropped only one set during the week. He trailed eighth-seeded Prajnesh Gunneswaran of India by a set and an early service break before prevailing 4-6, 6-4, 6-3 on Friday night in the quarterfinals. Against Harris, the 6-foot-4 (1.93-meter) Kokkinakis had 12 aces and one double fault, lost only one point on his first serve (26 of 27) and did not face a break point. The 6-foot-5 (1.96-meter) Harris finished with six aces and six double faults, and won only 8 of 27 points on his second serve (30 percent). Harris, appearing tight, lost his serve in the opening game when he netted a forehand putaway and for 1-4 on a double fault. Both players held serve for 3-3 in the second set before Kokkinakis broke twice on unforced errors. Harris, 21, of South Africa will crack the top 150 for the first time at No. 145. He was ranked No. 221 at the beginning of July. Kokkinakis also won the doubles title with countryman Matt Reid. Unseeded, they nipped top-seeded Jonny O'Mara and Joe Salisbury of Great Britain 6-2, 4-6 [10-8]. Kokkinakis became the first player to sweep the Aptos singles and doubles crowns since Chris Guccione of Australia in 2009 and the fourth in the tournament's 31-year history. Past competitors in the Aptos Challenger, the oldest in the United States, include International Tennis Hall of Famers Patrick Rafter and Michael Chang and future Hall of Famers Andy Murray, Bob Bryan and Mike Bryan. The Bryan twins played at Stanford in 1997 and 1998, winning the NCAA doubles title as sophomores. Kokkinakis collected $14,400 for the singles title and $3,100 for the doubles crown. Harris, who lost in the first round of doubles, pocketed $8,480 for reaching the singles final. Both Kokkinakis and Harris are scheduled to play in next week's $100,000 Vancouver Challenger. Kokkinakis drew second seed and countryman Jordan Thompson, ranked No. 100, and Harris will play a qualifier to be determined. Here are the complete Aptos singles and doubles draws. No. 4 seed Jenson Brooksby of Carmichael in the Sacramento area crushed No. 6 Drew Baird of Holly Springs, N.C., 6-1, 6-0 in 45 minutes today in the semifinals of the USTA Boys 18 National Championships in Kalamazoo, Mich.
Brooksby, 17, has not lost a set in the tournament. He reached the 16s final two years ago. Brooksby, who's headed to Texas Christian in the fall of 2019 or in January 2020, will face No. 3 seed Brandon Nakashima of San Diego. The winner will earn a wild card into the U.S. Open men's main draw, and the loser will receive a berth in men's qualifying in Flushing Meadows. Nakashima, last year's champion in the 16s, beat No. 26 seed Stefan Dostanic of Irvine in the Los Angeles area 6-2, 4-6, 6-2. Brooksby dominated Nakashima 6-2, 6-3 in the Easter Bowl quarterfinals and went on the win the title at Indian Wells in March. Meanwhile, No. 1 seed Rudy Quan from the Sacramento suburb of Roseville routed No. 5 Dylan Charlap of Palos Verdes Estates in the Los Angeles region 6-2, 6-1 to win the USTA Boys 12 National Championships in Mobile, Ala.
Quan lost no more than five games in any of his seven matches. He also won the 12s title in the USTA National Winter Championships in Tucson, Ariz., in January, Easter Bowl and USTA Clay Court Championships in Orlando, Fla., last month. In the final of the USTA Girls 16 National Championships in San Diego, No. 3 seed Fiona Crawley of San Antonio defeated No. 4 seed Allura Zamarripa of Saint Helena in the Napa area 6-4, 6-0. Crawley will receive a wild card into the U.S. Open girls tournament next month. In the girls 18 doubles semifinals in San Diego, No. 1 seeds Caty McNally of Cincinnati and Whitney Osuigwe of Bradenton, Fla., outclassed No. 4 Katie Volynets of Walnut Creek in the San Francisco Bay Area and Natasha Subhash from the Washington, D.C., suburb of Fairfax, Va., 6-1, 6-2. No. 4 seed Allura Zamarripa of Saint Helena in the Napa area defeated No. 1 Gianna Pielet of El Paso, Texas, 6-4, 7-6 (4) on Friday in the semifinals of the USTA Billie Jean King Girls 16 National Championships in San Diego. Zamarripa is scheduled to face No. 3 seed Fiona Crawley of San Antonio today. Crawley outplayed No. 17 Misa Malkin of Tucson, Ariz., 6-2, 6-3 after eliminating Zamarripa's twin, Maribella, 6-2, 6-2 in Thursday's quarterfinals. Rudy Quan of Roseville in the Sacramento area also will play for a gold ball. Quan, seeded No. 1, dominated No. 3 Alexander Razeghi of Humble, Texas, 6-3, 6-1 in the boys 12 semifinals in Mobile, Ala.
Quan will meet No. 5 seed Dylan Charlap of Palos Verdes Estates in the Los Angeles region. Charlap beat No. 2 Andrew Salu of Sarasota, Fla., 6-4, 6-2. In the boys 12 doubles final, No. 2 seeds Razeghi and Cooper Woestendick of Olathe, Kan., topped No. 3 Maxwell Exsted of Savage, Minn., and Quan 6-4, 6-3. Herrick Thomas Legaspi of Sacramento won the boys 14 doubles crown in Mobile with Nicholas Heng of Madison, Ala. Seeded No. 8, they upended No. 1 Lucas Brown of Plano, Texas, and Aidan Kim of Milford, Mich., 6-2, 7-5. Meanwhile, No. 4 seed Jenson Brooksby from the Sacramento suburb of Carmichael defeated No. 25 Jacob Bullard of Calabasas in the Los Angeles area 6-3, 6-1 in the quarterfinals of the USTA Boys 18 National Championships in Kalamazoo, Mich.
Brooksby, 17, will meet No. 6 seed Drew Baird of Holly Springs, N.C. Baird saved five match points in a 5-7, 7-6 (8), 6-2 victory over No. 9 Kevin Zhu of Houston after beating No. 16 Keenan Mayo of Roseville in the Sacramento region 6-3, 3-6, 6-3 in Thursday's round of 16. In the quarterfinals of the USTA Girls 18 National Championships in San Diego, No. 2 seed Whitney Osuigwe of Bradenton, Fla., beat No. 9 Katie Volynets of Walnut Creek in the San Francisco Bay Area 6-2, 6-4. Both players are 16. Osuigwe in 2017 became the first American to win the French Open girls singles title in 28 years and ended the year as the top-ranked junior in the world. Volynets remains alive in doubles with Natasha Subhash from the Washington, D.C., suburb of Fairfax, Va. Seeded No. 4, they will take on No. 1 Caty McNally of Cincinnati and Osuigwe in the semifinals. APTOS, Calif. -- Liam Broady accomplished an impressive feat today. He kept Lloyd Harris on the court for more than an hour. Not much more, and Broady still lost, but he has plenty of company lately. In a matchup of unseeded players, Harris rolled past Broady 6-2, 6-2 in 64 minutes today to reach the semifinals of the $100,000 Nordic Naturals Challenger on a gorgeous, 64-degree (17.8 Celsuis) day at the Seascape Sports Club. Harris, a 21-year-old South African, dispatched third-seeded Quentin Halys of France 6-4, 6-2 in 59 minutes in the first round and Joris De Loore of Belgium 6-2, 6-0 in 52 minutes in the second round. "I'm happy to keep the matches short and keep my body fresh for every round to come," said Harris, 6-foot-5 (1.96 meters) and only 176 pounds (80 kilograms). Harris, who won his first Challenger title last week in a $75,000 tournament in Lexington, Ky., extended his winning streak to eight matches. He has not lost more than four games in a set in any of them. "I've really just been focused on tennis and to keep on working and improving my game," Harris explained. "Every day I've just been practicing and trying to improve, and that's been the key for me." Harris soared 47 places to a career-high No. 161 with the Lexington title in Monday's updated rankings. That would have given him the fourth seed in Aptos, but the singles draw was held on Saturday based on last week's rankings. Harris had 10 aces and no double faults against Broady, a 24-year-old left-hander who reached last year's Aptos final as a qualifier. Harris won 83 percent of the points on his first serve (29 of 35) and 60 percent on his second delivery (6 of 10), and escaped both break points against him. "I felt I played tremendously well today," Harris crowed. "I came out of the starting blocks very (well) again and just kept that level up throughout the match. I felt I really served well, was defending well, attacking well, coming forward well -- all around a good performance." Harris turned pro three years ago out of high school. "I was never really interested in the college route," he said. In contrast, Harris' 32-year-old countryman, Kevin Anderson, starred at the University of Illinois for three seasons (2005-07). The 6-foot-8 (2.03-meter) Anderson has reached two of the last four Grand Slam singles finals, losing to Rafael Nadal in last year's U.S. Open and to Novak Djokovic at Wimbledon last month. "We touch base here and there and send texts back and forth," Harris said of Anderson. "When I'm in the bigger tournaments and I get to see him, we'll talk. I wouldn't say I know him very well." Asked whether Anderson has been a mentor to him, Harris said with a laugh: "It's hard to say. His results definitely have been a positive influence on me and the country." Harris will play 6-foot-7 (2.01-meter) Christopher Eubanks, who beat former top-70 player Ernesto Escobedo 6-4, 7-6 (6) in a hard-hitting battle of unseeded 22-year-old Americans. As he did against second-seeded Michael Mmoh in the second round, Eubanks frustrated Escobedo with his booming serve. Eubanks had 10 aces and two double faults and did not face a break point. He won 75 percent of the points on his first serve (36 of 48) and a whopping 74 percent on his second delivery (14 of 19). "I think I served well at critical times," said the 236th-ranked Eubanks, who turned pro last fall after his junior year at Georgia Tech in his hometown of Atlanta. "I think I did a good job of keeping my composure when I was under pressure a little bit on my service games. Anytime you play a match and don't get broken, it's usually a pretty good day. I was very pleased with how I served and how I played overall." Eubanks and Harris will meet for the first time in Saturday's second semifinal at about 3 p.m.
"Eubanks has a massive game and can play anyone off the court," Harris said. "It's going to be a really tough match, but I'm looking forward to it. It's going to be a great challenge for me." In the top half of the draw, Fabbiano, one of the smallest players in men's pro tennis at 5-foot-8 (1.73 meters) and 152 pounds (69 kilograms), won 6-2, 6-2 for the second consecutive match. This time, he outclassed U.S. wild card Martin Redlicki, a 6-foot-5 (1.96-meter) left-hander, in one hour. "The key was the same as (Thursday against countryman Stefano Napolitano)," said Fabbiano, who's ranked No. 105 after reaching a career-high No. 70 last September. "Good return, put the ball in -- he's a good server -- then do my shots. It was not that difficult today, but I had to be focused from the first to last point." Redlicki, a two-time NCAA doubles champion who graduated from UCLA in June, said he was most impressed by Fabbiano's "rally ball -- his regular, normal ball has that much more bite, it's that much heavier -- his ability to open the court, and his first ball. I would hit what I felt were some pretty decent returns off his serve, and he would just be able to take it and hit a winner off the first ball, which is something I wasn't expecting off the return I was hitting. I guess that's the next level I'm working for. "It was a really good learning experience, a good eye-opener. Lots to build on, lots to work on, a lot to look forward to." Fabbiano, who stunned Stan Wawrinka to reach the third round at Wimbledon last month, will face either fourth-seeded Thanasi Kokkinakis of Australia for the first time on Saturday not before 1 p.m.
Kokkinakis, who shocked Roger Federer in the second round in Miami in March, topped eighth-seeded Prajnesh Gunneswaran of India 4-6, 6-4, 6-3 after trailing by an early service break in the second set. Gunneswaran, a 28-year-old left-hander, double-faulted for the only break in the third set to trail 2-4. The 6-foot-4 (1.93-meter) Kokkinakis, who's rebounding from multiple injuries, has plummeted from a career-high No. 69 three years ago at age 19 to No. 268. But Fabbiano predicted Kokkinakis eventually will reach the top 10. "He's solid, big serve," Fabbiano said. "He's doing the right things. He's still young, so he can get his body even better than now. He will be on top in the next few years, for sure. He's a next-generation guy." Here are the updated Aptos singles and doubles draws and Saturday's schedule. Live streaming is available.